Fixmykite.com Self-Stick-Valves will stick on all bladders. Simply peel and stick to make a fast and easy repair, or stick it on any new bladder. Specially formulated adhesive is incredibly durable and will stick on any bladder material or color. 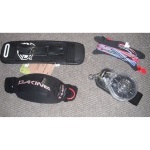 The 11mm Deflate (Dump) Self-Stick Kiteboarding-Valve is used on most kites as the deflation system.